This Page is being updated to reflect the successful completion of the reunion and to provide a report on same. Until then you can read below and get a good idea of how it went. The things you read that we planned, we did and it was great! Look for upcoming information on the 2020 Reunion planning. We had a fine time at our last reunion in Boothbay Harbor, Maine and there you voted to have our first time Norfolk/Virginia Beach reunion in this area that boasts the largest concentration of military in the United States. View some photos by visitors here. If you are wondering why we are meeting in April, other than the fact that the weather is beautiful, it is because the world’s most spectacular military entertainment event is happening then and our reunion attendees will have premium seating to experience this extravaganza. Watch this video for a taste of what is to come in 2018 if you attend the 22nd anniversary of the Virginia Art’s Counsel’s Tattoo at the Scope Arena in Norfolk, Virginia that will close our fifteenth reunion on Saturday evening, April 28, 2018, as we celebrate our 25 years of wonderful times together in reunion. Our base of operations will be the Wyndham Virginia Oceanside Beach Hotel where every room has a direct view of the Atlantic Ocean and when you leave the hotel you are 35 to 40 feet from an expansive sand beach, ideal for a nice romantic or playful walk before or after dinner. An overall wonderful time is planned with great venues, delicious food, entertainment and time together arranged in such a way to be a well paced and enjoyable for all who attend, young and old. The reunion registration will begin soon upon your receipt of a mailed card explaining how you can arrange for registration and payment of your reunion fee. You will be able to pay and register on-line with a credit card or by check if you prefer. If for some reason you do not get such a card, please advise us of that and do not let it deter you. Just click on the registration page above and proceed as instructed. For those wishing a paper registration package, let Bob know at the contact information provided. The rate is now $325 per person. This provides you with all meals (all breakfasts, lunches and three banquets as well as all venue entry fees, buses, sightseeing, entertainment special name tags, refreshments and all that comes with a USS ORLECK quality reunion, all for one price. You get a full breakfast for room occupants. This hotel room rate is unheard of at this special Tattoo event time where most hotels, even those not on the ocean, have rates that are half again higher without breakfast than ours is with breakfast. Be aware that room numbers blocked were limited at first by the hotel to 60 rooms and those are gone but they gave me an additional 10 rooms but those are about gone. They will be given on a first come/first serve basis. The hotel rate applies three days before and three days after if rooms are available and since that is now an issue on availability, you should be trying to book now if you plan to attend. For those flying they will be picked up and delivered to the hotel at no added cost. If you have not gotten those details from me by March 15, please contact me, Bob Orleck. Below are details that will add meat to that schedule with explanations and information on what you will be doing so to enable you to be prepared and to totally enjoy your reunion vacation. You will need both documents and view them together when you are reviewing the activities of the day. The reunion does not begin until 11:00 AM on April 26th in the Hospitality Room when we will finalize registration, provide you with your name badge and supply you with all the information you will need for enjoyment of your reunion. If you have memorabilia you wish to bring you can display that in our hospitality room. Early arrivals check into the hotel and should ask for the current schedule of events at the desk or you can get one in the Hospitality Room. If you copied and brought the tentative schedule from the computer, please discard it and use the one you get at the hotel. If you don’t, you might miss an important time point and it could be a real problem for you. Any changes or updates after your arrival will be posted in the Hospitality Room. We will spend the day when most people will arrive in the Hospitality Room at the Wyndham. We will finish our registration process, have our traditional pizza lunch right in the hospitality room and do those special things we always do during our leadup to the evening banquet at the hotel. The opening night will take place at our hotel where we will have a fine meal, guest speaker and entertainment by Frank Cuillo. If you are in town on the 22nd of April, you may want to take in Frank’s special show. Click on the picture for details. 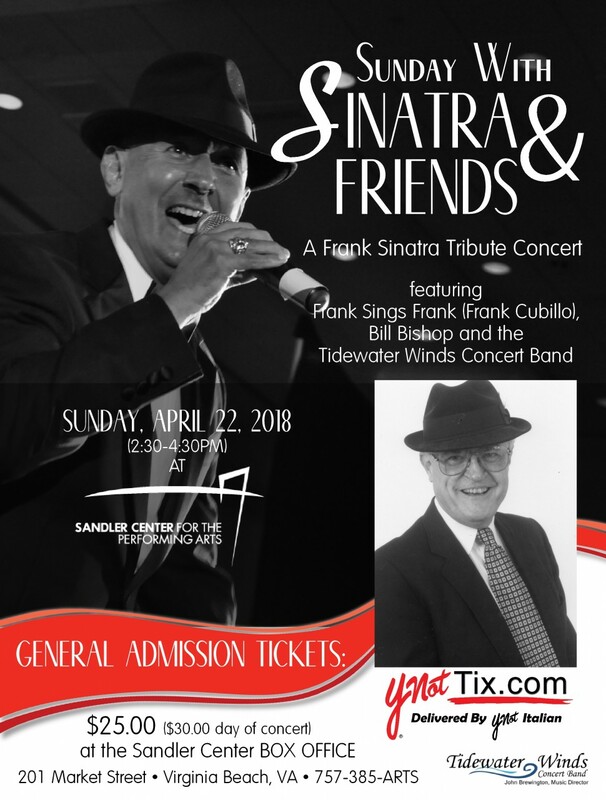 Frank is a wonderful entertainer that will make you feel like you are being entertained by the late great Frank Sinatra. You can like and follow Frank on Facebook. If you want to listen to a few pieces of some famous Sinatra songs just listen a little to the Voice of Frank. We have a very strict time frame for boarding the buses to go to the Victory Rover Boat Tour. Please make sure to get breakfast early so you will be ready to board at the appropriate time. For those who slept late and didn’t have time to sit down for breakfast there will be some breakfast bars in the hospitality room. If you are planning on eating that way, it would be a good idea to get them the night before. We will have coffee and donuts aboard the boat tour. Once back on land, board the bus and learn about Norfolk’s colorful history of over three centuries as you ride through the lovely historic district and restored areas. View the stately homes along The Hague, the Moses Myers House, the Chrysler Museum of Art, MacArthur Memorial, the historic Freemason District, the restored waterfront area, as well as many other points of interest. Downtown Norfolk has undergone a complete transformation in the last decade and features the beautifully renovated Town Point Park with the Armed Forces memorial, a beautiful $34 million cruise terminal, waterfront condos and state of the art shopping area. Lunch will take place at the Waterside District, where guests will enjoy a delicious meal at this new waterfront marketplace. Following lunch, visit Nauticus, a unique and thriving campus of visitor attractions that explores the economic, naval, and natural powers of the sea. Features here include a series of interactive exhibits, 3D, high-def films in the 250-person Theater, and aquariums of marine life. Also housed here is the Hampton Roads Naval Museum, one of ten museums officially operated by the U.S. Navy. Highlights of the naval battles and exhibits of detailed ship models, artwork, and memorabilia are showcased throughout. A true highlight of any visit to Nauticus is a self-guided tour of the Battleship Wisconsin, one of the famous Iowa-class ships. This great ship saw action in WWII, the Korean War and most recently in the Persian Gulf War. The USS ORLECK was there with her as well as the Turkish destroyer, TCG YUCETEPE D345. The Wisconsin is permanently berthed beside Nauticus where it is accessed by a connecting walkway. Explore the main deck and recently opened portions of the interior to learn about this famous ship, those who fought and served on board and the role that this mighty warship has played in the defense of our nation. Return to Virginia Beach to enjoy the beautiful views of the Atlantic Ocean and the Chesapeake Bay as you learn about the history of Virginia’s largest city and get the pulse on current day in Virginia Beach on a narrated riding tour. See the First Landing Cross at Cape Henry where the English colonists first came ashore in 1607 prior to settling at nearby Jamestown. Walk out on the overlook to see where the bay and the ocean meet, and where the famous Battle of the Capes took place during the Revolutionary War. Lighthouse (small admission fee to climb, pay on own if desire) or shop in the gift shop for all things Lighthouse related. Ride down the resort strip, see the historic Cavalier Hotel as well as the Tidewater Veterans Memorial, a unique structure which pays homage to veterans everywhere. We will depart the hotel with our tour guide just in time for lunch which will be a bit unusual. Doumar’s Barbecue is the home of America’s first ice cream cone and was featured on the food channel. They have curb service like the old drive-in eateries and the timing seemed to be right to be there at lunch. So we will arrive and one of the family will come aboard the buses and give us the history involved. We will have a limited menu of sandwiches like hamburgers, grilled cheese, French fries, drinks and you will make your selection in the hospitality room when we register. The curb service wait staff will then come on the bus with bags with your food and you will eat on the bus. When done you can go inside and get your ice cream cone made with the same original cone making equipment and you will see it at work. We will enjoy a stop at the Chrysler Museum of Art, housed in an Italianate-style structure facing the picturesque Hague Inlet of the Elizabeth River. Hailed as one of the top 20 art museums in the country by The Wall Street Journal, the Chrysler Museum’s encyclopedic collection of over 30,000 objects, paintings, photography, glass, sculpture and decorative arts spanning almost 5,000 years of the history of art. The museum recently underwent a $24 million expansion and renovation and features works of artists such as Picasso, Warhol, Dali, Degas, Matisse, Cezanne, Rodin and Renoir. Guests may also have the opportunity to tour the Chrysler Glass Studio and view artists practicing the 400-year-old skill of glass blowing. Next, visit the MacArthur Memorial for a glimpse into our country’s history. Here you will view the outstanding collection housed in Norfolk’s historic city hall which trace the life and achievements of five-star General Douglas MacArthur. You will also have the opportunity to view the short film which chronicles the General’s life. The General and Mrs. MacArthur are entombed in the rotunda of the memorial. Nine separate galleries arranged in two levels circle the rotunda and tell the story of General MacArthur and the millions of American men and women who served in the United States Armed Forces from the Civil War through the Korean War. A gift shop with unique memorabilia is located on the premises. We will visit old St. Paul’s Church, Norfolk’s oldest standing building, established in 1637. It was the only structure that survived the famous bombardment of Norfolk during the Revolutionary War in 1776 and today a cannonball still remains lodged in its Colonial brick exterior. Guests can walk the cemetery and grounds, and if there is no service being conducted within the church, they are welcome to enter the building to view the beautiful stained glass windows and centuries old wooden pews. Next, on to a fun-filled night at The Virginia International Tattoo! The experience will begin with Taste of Tattoo: A Pre-Performance Dinner Experience, featuring lively entertainment acts performed on a stage while guests enjoy a delicious, plentiful Southern buffet dinner. During our dinner, outside the Scope Arena, there will be vendors and some of the entertainers you will see in the evening performance of Tattoo. Food vendors serve a variety of foods but of course we will by the time we arrive there, be well fed. We will not be spending too much time there but we will be passing through on the way to the entrance of the Scope. It’s on to the main event—the Tattoo, the largest in the United States. Evolving from a 17th Century European tradition, the Virginia International Tattoo is a ceremonial performance of military music by massed bands and is the largest show of its kind in the United States. Presented annually in Norfolk, the Tattoo is an exhibition of marching bands, massed pipes and drums, drill teams, gymnasts, Scottish dancers, choirs and more. Each year, a cast of over 700 artists from many different countries creates an unforgettable spectacle under one roof for four breathtaking performances. As is our tradiiton, we will end our reunion with a non-denominational church service at our final breakfast together until we meet again at our next reunion time. Transportation will be provided to the airport for those flying. 6 April 2017 Norfolk 2018 Reunion-Bring Raffle or Auction item if you can.